CHICAGO With no signs of trauma and nothing to raise suspicions, the sudden death of a Chicago man just as he was about to collect nearly $425,000 in lottery winnings was initially ruled a result of natural causes. Nearly six months later, authorities have a mystery on their hands after medical examiners, responding to a relative's pleas, did an expanded screening and determined that Urooj Khan, 46, died shortly after ingesting a lethal dose of cyanide. The finding has triggered a homicide investigation, the Chicago Police Department said Monday. "It's pretty unusual," said Cook County Medical Examiner Stephen Cina, commenting on the rarity of cyanide poisonings. "I've had one, maybe two cases out of 4,500 autopsies I've done." 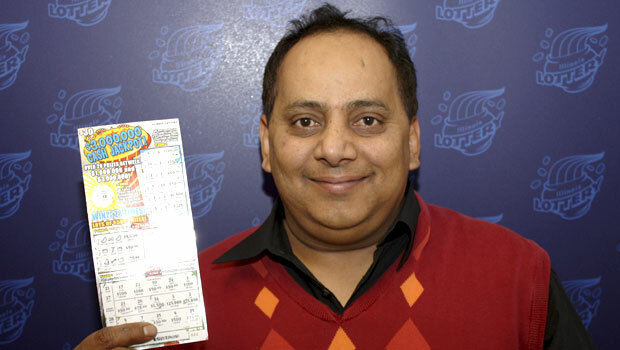 In June, Khan, who owned a number of dry cleaners, stopped in at a 7-Eleven near his home in the West Rogers Park neighborhood on the city's North Side and bought a ticket for an instant lottery game. Ashur Oshana, the convenience store clerk, told The Associated Press on Monday that Khan said he had sworn off gambling after returning from the hajj, a Muslim pilgrimage, in Saudi Arabia. Khan said he wanted to lead a better life, Oshana said, but Khan bought the tickets that day and scratched off the winner in the store. "Right away he grabbed my hand," Oshana said. "He kissed my hand and kissed my head and gave me $100. He was really happy." Khan recalled days later at an Illinois Lottery ceremony in which he was presented with an oversized check that he jumped up and down in the store and repeatedly shouted, "I hit a million!" "Winning the lottery means everything to me," he said at the June 26 ceremony, also attended by his wife, Shabana Ansari; their daughter, Jasmeen Khan; and several friends. He said he would put some of his winnings into his businesses and donate some to a children's hospital. Instead of the full $1 million over installments, Khan opted to take his winnings in a lump sum of just over $600,000. After taxes, the winnings amounted to about $425,000, said lottery spokesman Mike Lang. The check was issued from the state Comptroller's Office on July 19, the day before Khan died, but was cashed on Aug. 15, Lang said. If a lottery winner dies, the money typically goes to his or her estate, Lang said. Khan was pronounced dead July 20 at a hospital, but Cina would not say where Khan was when he fell ill, citing the ongoing investigation. No signs of trauma were found on Khan's body during an external exam and no autopsy was done because, at the time, the Cook County Medical Examiner's Office didn't generally perform them on those 45 and older unless the death was suspicious, Cina said. The cutoff age has since been raised to age 50. A basic toxicology screening for opiates, cocaine and carbon monoxide came back negative, and the death was ruled a result of the narrowing and hardening of coronary arteries. Cyanide can get into the body by being inhaled, swallowed or injected. Deborah Blum, an expert on poisons who has written about the detectives who pioneered forensic toxicology, said the use of cyanide in killings has become rare in part because it is difficult to obtain and normally easy to detect, often leaving blue splotches on a victim's skin. "The thing about it is that it's not one of those poisons that's tasteless," Blum said. "It has a really strong, bitter taste, so you would know you had swallowed something bad if you had swallowed cyanide. But if you had a high enough dose it wouldn't matter, because ... a good lethal does will take you out in less than five minutes." Only a small amount of fine, white cyanide powder can be deadly, she said, as it disrupts the ability of cells to transport oxygen around the body, causing a convulsive, violent death. "It essentially kills you in this explosion of cell death," she said. "You feel like you're suffocating." A relative came forward days after the initial cause of death was released and asked authorities to look into the case further, Cina said. He refused to identify the relative. "She (the morgue worker) then reopened the case and did more expansive toxicology, including all the major drugs of use, all the common prescription drugs and also included I believe strychnine and cyanide in there just in case something came up," Cina said. "And in fact cyanide came up in this case." The full results came back in November. Chicago Police Department spokeswoman Melissa Stratton confirmed the department was now investigating the death and said detectives were working closely with the Medical Examiner's Office. Investigators will likely exhume the body, Cina said. Calls to Khan's family went unanswered Monday. A knock on the door at the family's small, two-story house late Monday afternoon wasn't answered.